New Delhi : The Anti-Corruption Crime and Corruption Front of India held 'Against Terrorism Event and Supreme National Excellency Awards 2019' on Friday, April 12 at Arya Auditorium at East of Kailash, New Delhi. The award ceremony was organised with the help of India's popular Page-3 Magazine 'Glamorous'. Bollywood actor Ameesha Patel was present as the chief guest of the award ceremony. 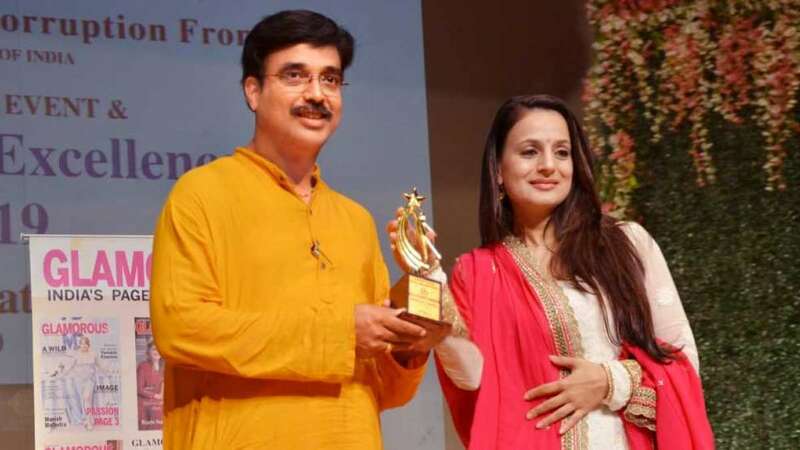 Ameesha Patel, who has worked in blockbuster Bollywood movies like Gadar: Ek Prem Katha and Kaho Na Pyaar Hai, felicitated Manoj Kumar Sharma, Managing Director of PR Guru, at the award ceremony and congratulated him for his social services. The National Excellence Award for the year 2019 was conferred upon individuals and organisations in the society who are fighting against social injustice, terrorism and corruption. Manoj Sharma was honoured for highlighting the plight and raising the voices of the downtrodden and the needy. Through his PR agency, Manoj Sharma has given a platform to the acid attack victims, women abandoned by their husbands, women cheated by NRI grooms, highlighted the plight of retired Army officials and pensioners. Being a responsible member of the media, he has constantly worked towards becoming a voice of the voiceless. "There is a pertinent need in the society to come forward and help the oppressed and exploited section. The world today is in dire need of such selfless people who help the downtrodden without seeking personal benefits. I am proud to be a part of an award ceremony that recognises the humanitarian work of such selfless beings," said Ameesha Patel. PR Guru's MD Manoj Sharma credited his parents and wife for being his source of inspiration. "I draw inspiration to work for the weaker section of the society from my parents and my loving wife. As soon as I started the work of a PR agency, I started working with full dedication to fulfilling my goal. In my career, I have come across several oppressed women and I have tried my level best to make their voices heard and help them get justice. Not only this, my PR agency has constantly worked towards raising the issue of retired Army officers so that the government listens to their plea. I do not expect any prize for this work for it is my personal inspiration to help the ones in need and I would continue doing that," Mr Sharma said. Harpreet Singh Tony, the organiser of the event and president of Anti-Corruption Crime and Corruption Front, on this occasion said, "I would like to congratulate the recipients of the award for these people are fighting together against terrorism and corruption in the society. Along with terrorism, the menace of corruption has poisoned our system to a great extent. In order to inspire other intellectuals in the society to be united against such evils, our organisation 'Anti-Corruption Crime and Corruption Front' has felicitated these awards. The world today, badly needs such great men who are thinking about the wellbeing of others."